1 inch punch for the scallop to go behind it. What an adorable Valentine Treat. The twine really sets it off....The cupid guy is so cute,love the way he wobbles..and those eyes(WOW)...Good job !! I LOVE to use my ACtion Wobbles on kids cards,like Elmo! Congrats Laurie! 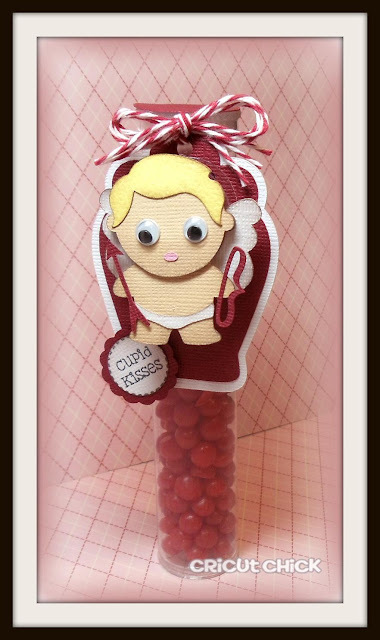 !Super Cute Cupid!Yummy Treats! Love the googly Eyes! !Whenever I add Action wobbles to my projects I always say "I added an Action Wobble on my project for an additional touch of CUTENESS! Very cute Valentine idea; I have a few wobbles and use them whenever I can on cards! Already a follower of your blog & Avtion Woble. I love wobbles and since it is almost Valentine's Day it would diffinitly be a heart I would wobble. So cute--I like the shape of the tag and the googly eyes. I think my grand kids would like wobbles on their Valentine's cards. Super cute! I would use a wobble on a card. This is sooo freaking cute! I Love it!!!!!! just got mine, willbe using it on a birthday card , I'm making a "Tigger" card... "bouncing in to wish you a happy birthday" jrg. I am already a follower of Action Wobbles, I loved Turkey Wobbles, and Santa Wobbles, I will Wobble my Heart away and next I am going to wobble my Lucky Leprachaun right into St. Paddies Day! Thanks for all of your great ideas!